Apple bought Beats Music to improve its standing in the streaming music marketplace, but the Cupertino company has its work cut out if it wants to compete with high-profile rivals Spotify and Pandora. 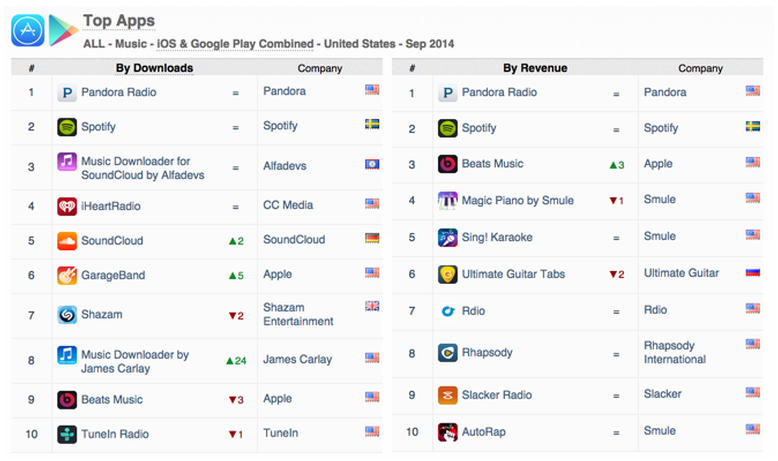 According to App Annie metrics cited by CNET, Beats Music continues to trail its rivals in two important App Store metrics -- downloads and revenue. In the App Annie download rankings, Beats Music places ninth behind other music apps such as Shazam, GarageBand, SoundCloud and iHeartRadio. This lower ranking is undoubtedly affected by service pricing, as Beats Music requires a subscription while both Pandora and Spotify offer free, ad-supported options in their mobile apps. By revenue, Apple's Beats Music benefits from its subscription model, ranking third behind market leaders Pandora Radio, which grabs the number one spot, and number two Spotify. The revenues measured in these metrics compromise only App Store payments to download the app and in-app purchases which include monthly subscription fees. It does not account for additional sources of revenue, such as advertising which is used extensively by Spotify and Pandora. Still, Beats is showing some improvement according to App Annie's statistics, moving up three spots on the revenue chart. Apple purchased Beats Music as part of a larger $3 billion acquisition that also included Beats' popular line of audio products. Apple reportedly is planning to overhaul the Beats Music service with a refresh slated to debut early next year. The company allegedly also is in negotiations with music industry executives about slashing the monthly subscription cost, perhaps as much as in half to $5 per month. Apple needs to improve their own default music app before they can even think about improving somebody else's. Music is at a crossroads of sorts.. Without a clear and reasonable revenue model, where will we see new creative musical voices coming from? iTunes has kept things going longer than many anticipated, by giving users a realistic alternative to illegal downloading/sharing. I'm not sure anyone knows what to do next? Which may mean the decline of music creation, which was already difficult enough to avoid poverty and obscurity. The talent and creativity is still out there, but is it valued in the way it once was? It's definitely not valued like it once was, but there are reasons for that. Labels blame piracy, I blame the labels. First, they stopped investing in real artists long ago. Since the 80's, major labels have only been interested in momentary one hitters. They can sign them cheap, make a bunch of money and then move on to the next one. Second, they're so scared of piracy that they've retooled their entire business model to try and lure pirates into paying for music. It's incredibly stupid, totally naive, and doomed from the start. The entire streaming thing is a monster of their own creation and now they're realizing that it's going to eat them. I say good. Let them be eaten, let the major labels die. Streaming works for small artists. They can refer people to these services to hear their music for free, and then as they build a fan base, can sell them records and other merchandise and attract them to shows. These artists are largely independent and don't care if they make money from streaming, whatever comes in is a bonus. That's the model, it works, it's been working and it's been growing. There's no room in it for Miley Cyrus, Kesha or the other autotuned flavors of the week--who's fans aren't interested in investing in a physical product like a record--but there's plenty of room for lots of others. Not surprising since almost nothing has been done to Beats since Apple acquired it. Nor does it have a free option as both Pandora and Spotify do which inevitably draws in paying customers. I just hope Apple doesn't screw up Beats when they do get to working on it. Looks like Apple bought the wrong company. As a heavy user of all 3 of those main services, I'd say Apple bought exactly the right company. Beats is a much better cultural fit for Apple than either Pandora or Spotify. Did I read the chart wrong? Beats looks just like Apple looks in the big picture. Apple doesn't sell the most product but their profit is healthy. Beats may not be the most downloaded but their revenue is among the highest. We'll see what position it is in when they integrated it directly into OS X and iOS. Not too crazy about the Beats Music UI. Plus, it seems that it is targeted at the hip-hop and rap genres which I don't listen to. I'll stick with Spotify until Apple integrates Beats into iTunes. Ever since I bought a semi-decent pair of headphones* I'm amazed at how horrible the quality is on Pandora. I'll try out Beats at some point but Spotify or iTunes Radio seem like the only viable options for myself right now (outside of purchasing). If you are looking for high-quality streaming, you may want to check out qobuz.com and tidalhifi.com. Both services offer CD-quality streaming (lossless encoding at 44.1 kHz, 16 bits). I don't know where you live, but Qobuz is not yet available in the US. Unrelated to any particular service, your new cans may be revealing not only inadequacies in the quality of the stream, but also the dynamic compression employed so rampantly in today's mastering. Regrettably, there is no workaround for this problem. Although, quartering offending mastering engineers might be a good place to start. You think? Beats is hipster crap Steve Job would never let this ever happen.